At almost every Ryder Cup, one duo seems to emerge with electrifying play and this year was no exception. 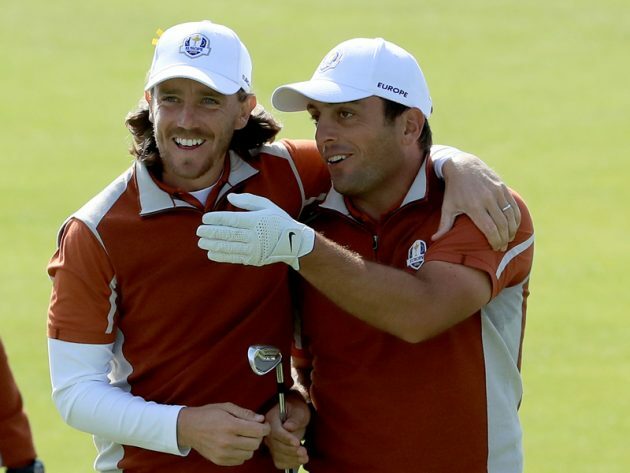 The pairing of Francesco Molinari and Tommy Fleetwood was simply outstanding on Friday and Saturday at Le Golf National, becoming the first duo in European team history to go undefeated in all four team sessions. It was the first time the Italian and Englishman had ever teamed up, but they could have fooled us. “Moliwood”—or “Fleetari”—notched Europe’s only point in the morning session on Day 1 and then steamrolled young guns Jordan Spieth and Justin Thomas in the afternoon to a tune of 5&4. On Saturday, it was more of the same. Moliwood didn’t make a bogey the entire day, dominating Tiger Woods and whoever was unlucky enough to be paired with him in both the morning and afternoon sessions. In all, the duo beat Tiger three times and won 27 of the 60 holes they played together thanks to 22 total birdies. “I’m pretty pissed off: the fact that I lost three matches and didn’t feel like I played poorly,” Woods said after the end of play on Saturday. “When one was out of the hole, especially in best ball, the other one made birdie and vice versa. They did that a lot to us.” To say the Europeans fans merely enjoyed the performance would be quite the understatement. It was a rough week for most of Jim Furyk’s captain’s picks, who contributed a combined two points to the American side and went a dismal 1-7 in the team matches. Tiger went winless for the week, losing all three of his team matches as well as his singles match against Jon Rahm on Sunday. The 14-time major champion is now a paltry 13-20-3 for his career in the team format, and hasn’t won a single four-balls match since 2006 when he and Jim Furyk beat Colin Montgomerie and Padraig Harrington! Needless to say, Tiger’s signature fist pumps were extremely few and far between at Le Golf National. Bryson DeChambeau’s Ryder Cup debut was also rather underwhelming. After winning two FedEx Cup playoff events earlier this month, many suspected the 25-year-old would be a key contributor on the American side. Unfortunately, DeChambeau struggled mightily with his putter throughout the week and wound up on the wrong side of two 5&4 decisions in the team sessions. He also lost to Alex Noren in his singles match on Sunday. Mickelson only played two matches last week and got walloped in both of them, accompanying DeChambeau for one of those 5&4 losses and running into a Molinari buzz saw on Sunday for a 4&2 loss. Tony Finau was the only bright spot of the lot. The 29-year-old went 1-1 in the team sessions and brought Tommy Fleetwood back down to earth on Sunday with a 6&4 drubbing in the finale. Patrick Reed was dubbed Captain America for his incendiary performance at Hazeltine in 2016 that fuelled the U.S. to a Ryder Cup victory. But Reed did not play well in the team sessions last week and the fans did not hold back from letting him know it. 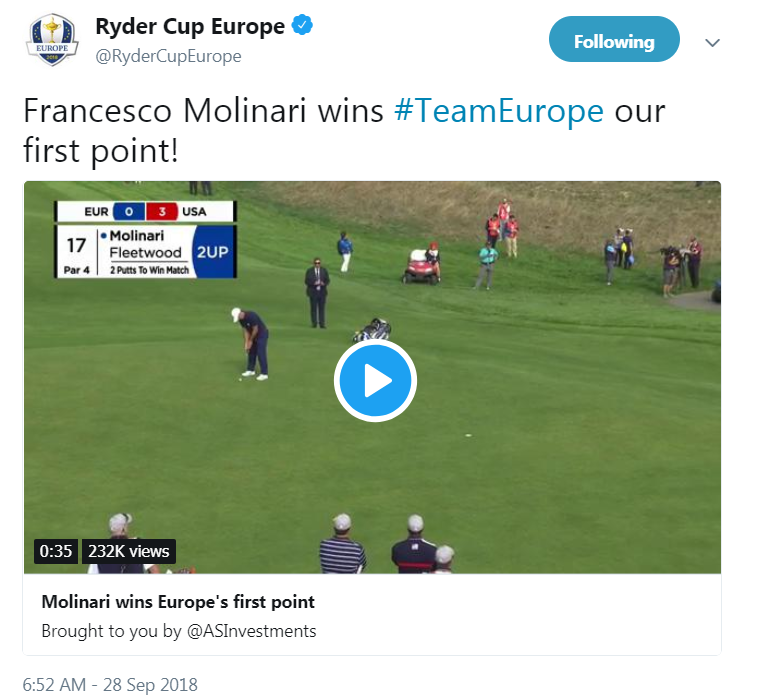 Neither did Francesco Molinari’s brother, Edoardo, who roasted the defending Masters champion with this brutal tweet on Saturday morning. Yowza! Rory McIlroy was not especially sharp with his putter this past season. In fact, the Northern Irishman was ranked 121st overall in strokes gained on the greens. But when an American fan reminded him of that statistic in his afternoon session on Saturday, Rory let him know in demonstrable fashion that some figures are misleading. “I can’t putt? !” Lol! 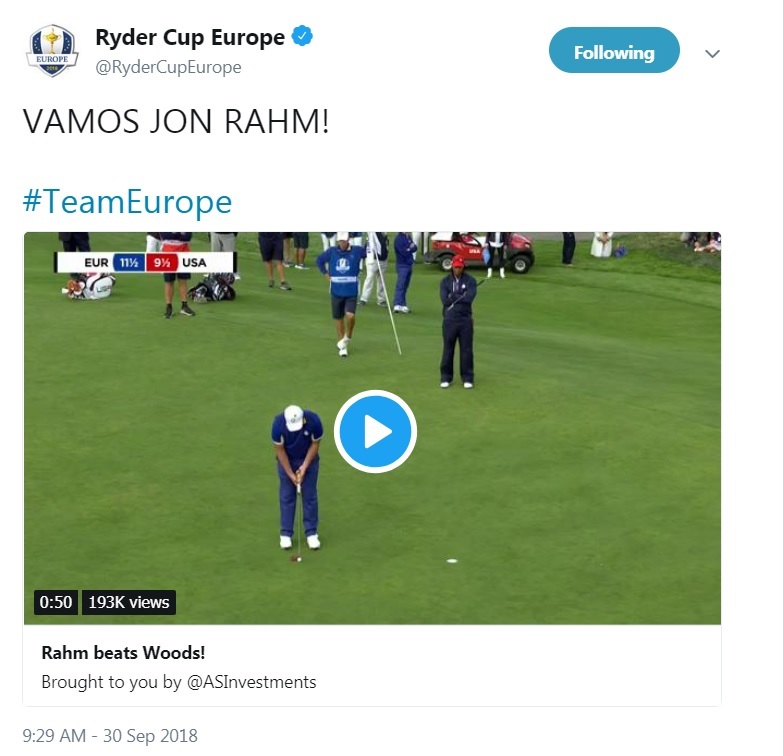 It was Jon Rahm’s first Ryder Cup appearance and, like Bryson DeChambeau, he struggled through the team sessions, losing both of his matches. But Rahm found his game in the singles sessions on Sunday, handing Tiger Woods his fourth loss of the week in a closely fought battle. As expected, the 23-year-old went absolutely nuts for a moment after putting the dagger into Woods on the 17th hole before regaining his composure and shaking his opponent’s hand. 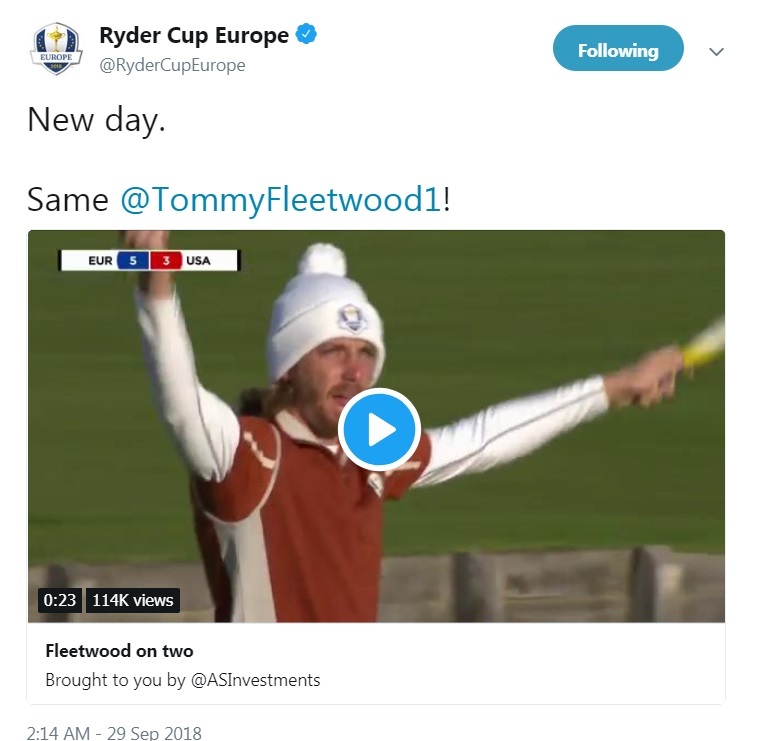 Say what you will about Ian Poulter, but no one loves Ryder Cups more than he does. Poulter spent most of the week sinking huge putts and riling up the crowds, often at the same time. 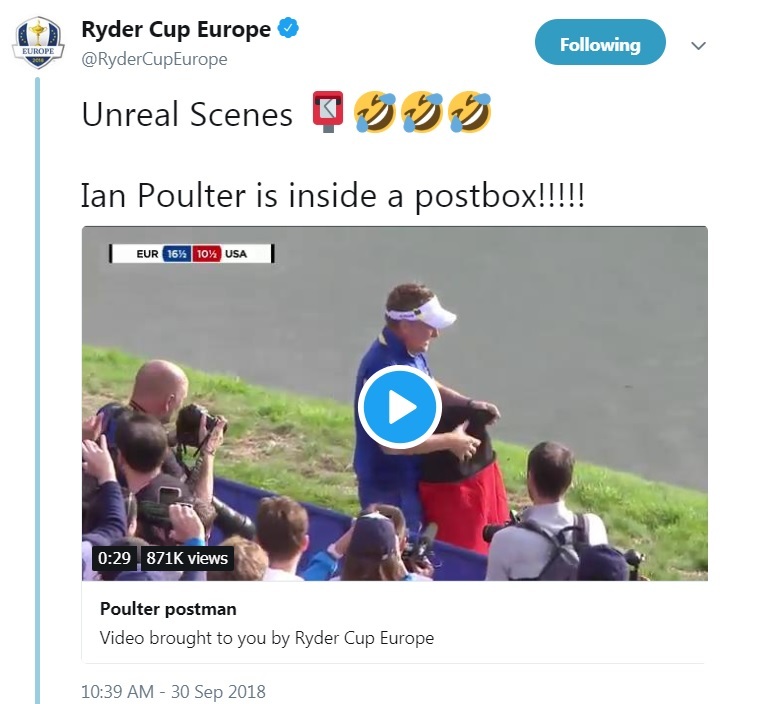 On Sunday, after Europe clinched the Ryder Cup, the Englishman celebrated by beating his chest while donning a fan’s foam mailbox costume. It was pretty amazing! The duo of Ian Poulter and Rory McIlroy found themselves in a precarious spot on Friday afternoon when Poulter’s tee shot on the 13th hole came to rest on a severe slope just above a pond. The ball was well below McIlroy’s feet when he addressed the ball, leading to many thinking that he would merely pitch it out safely. 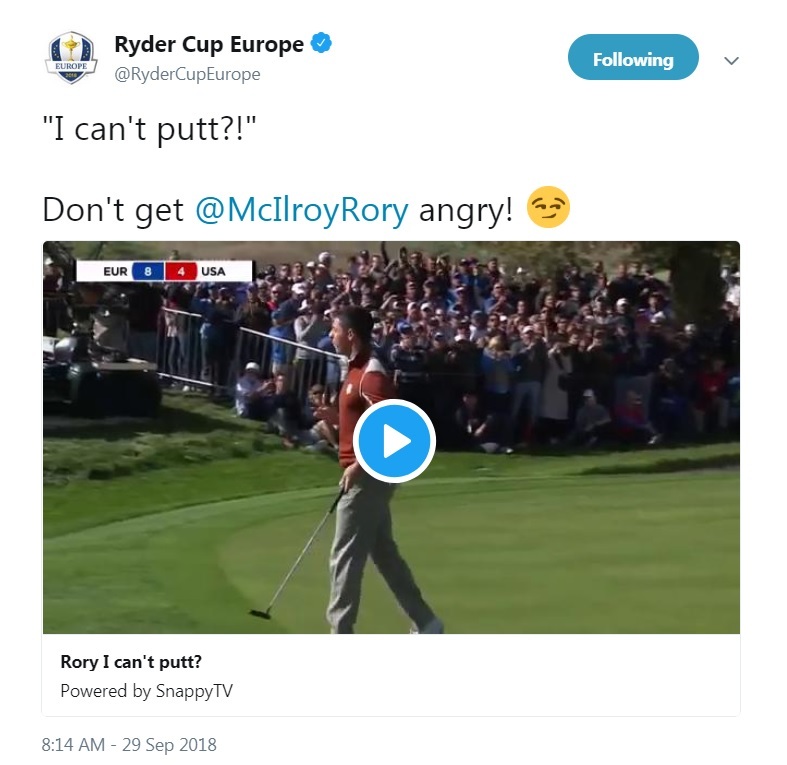 McIlroy had other plans . . .